This Muhammara recipe is made with roasted red peppers, lightly toasted walnuts and the sweetness of pomegranate. It is creamy and delicious and very easy to make, a big crowd pleaser. One of my approaches to cooking is this – Follow the peppers and you’ll find amazing foods wherever you go. Take the Middle East, for example. Follow the peppers into that region and you’ll encounter some highly flavorful dishes. We’re talking all sorts of recipes you can’t make properly without peppers, like harissa, Zhug (Yemenite Green Hot Sauce), Shakshuka, and this addictive spread that is made with wondrous roasted red peppers that, frankly, make everything taste great. 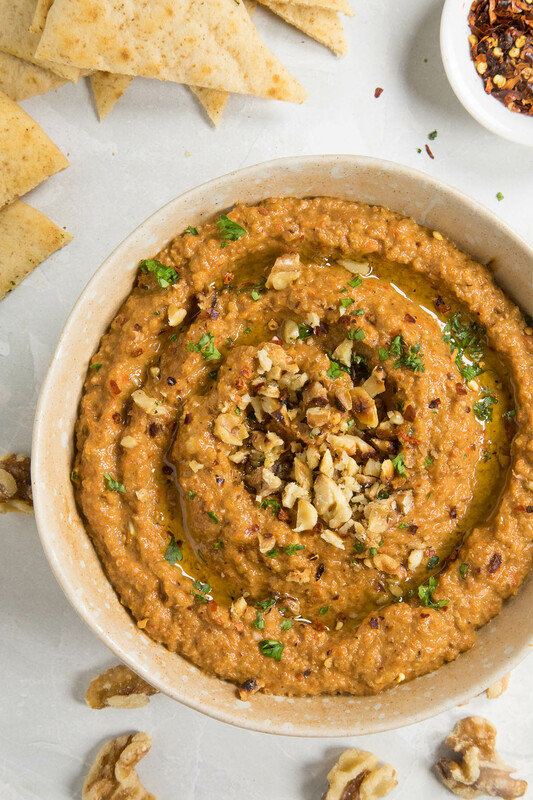 We’re talking Muhammara, my friends, and you’re going to love it. 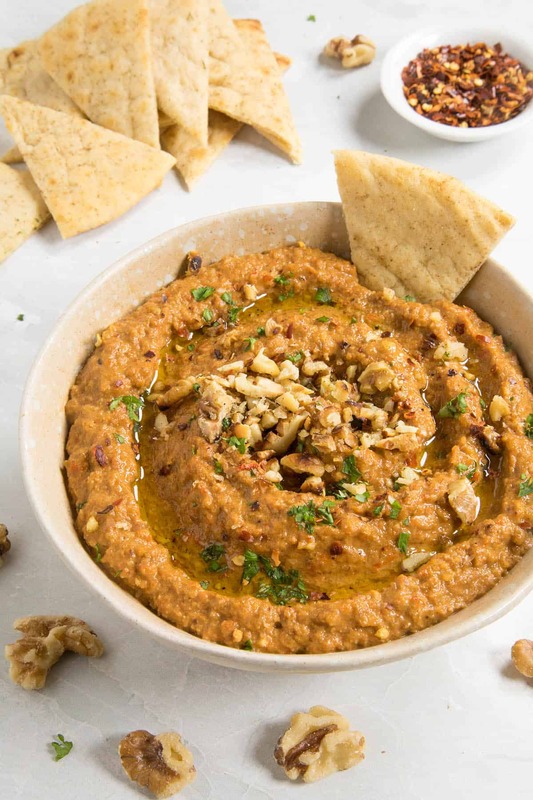 Muhammara is a seductive Middle Eastern spread or dip made with roasted red peppers, toasted walnuts, pomegranate molasses, and a few other ingredients and seasonings. It is typically served as a dip or a spread, though it is actually much more versatile. It’s huge on flavor, and it’s a recipe worth keeping in your back pocket for gatherings where you can be the star just by bringing this. 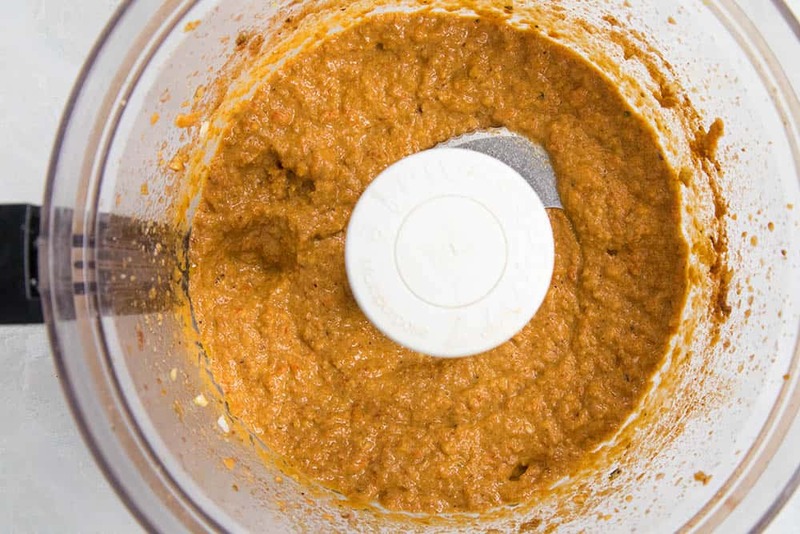 Personally, I would say that muhammara is sort of a cross between an Italian Pesto and a Spanish Romesco Sauce. It’s creamy and addictive. I LOVE this stuff. First, Set your oven to broil. Slice the red peppers in half lengthwise and core out the insides. Remove the stem. Set the peppers on lightly oiled baking sheets. Broil them in the center of the oven for 20 minutes, or until the skins char and bubble up. Remove from heat and cover with paper towels to let the skins steam up. Remove the skins and discard them. You can learn more about How to Roast Chili Peppers here. 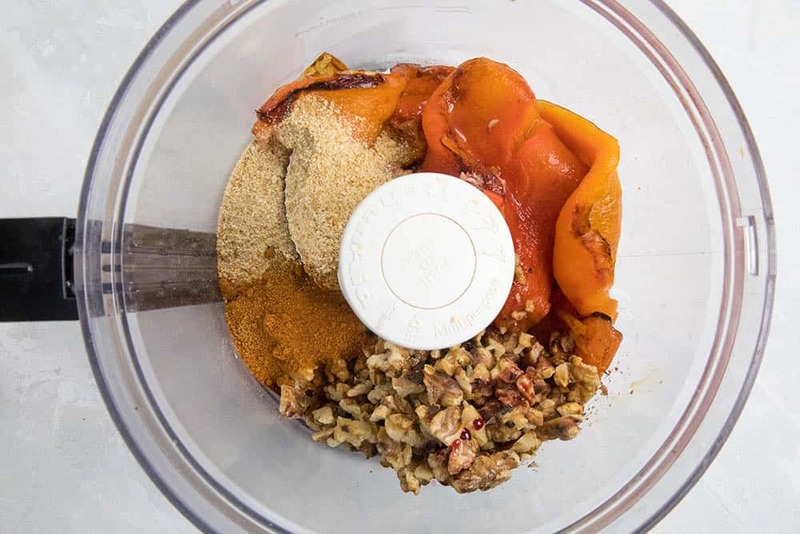 Give the roasted peppers a rough chop and toss them into a food processor. While the peppers are roasting, lightly toast the walnuts in a dry pan about a minute or two, tossing here and there. Do not let them burn. Set them into the food processor. Add the remaining ingredients except the olive oil to the food processor. Process the mixture while drizzling in the olive oil a bit at a time, until all of the oil is incorporated and the dip is nice and smooth. I always like my spreads just a bit chunky, so you can process it to your personal preference. Spread into a bowl and garnish. Serve with toasted pita. Pretty easy, right? And super delicious. And unique! I’ll bet no one else is bringing muhammara to the party. 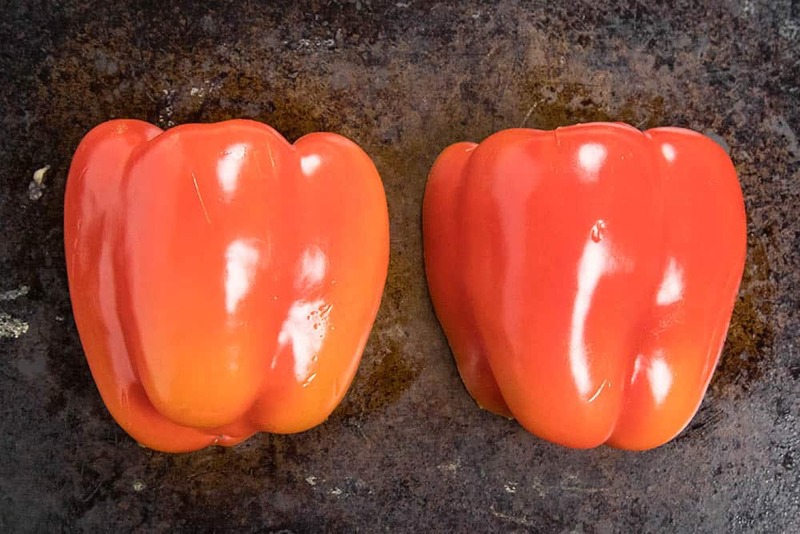 Milder peppers are more traditional for making muhammara, as it isn’t meant to be a spicy dip or spread, but that doesn’t mean you have to stick to bell peppers and that you can’t include spicy peppers. Consider making this with any thicker fleshed sweet pepper, such as the Corno di Toro. Feel free to toss in some roasted red jalapeno peppers, or a few serrano peppers. Habanero peppers, anyone? Absolutely! You can adjust the heat factor to your palate’s delight. Pomegrate molasses is, admittedly, a unique recipe ingredient, one you probably won’t find in your regular grocery store. You can find it in specialty stores, but if you can’t find it, simply reduce some pomegranate juice until it is thickened. Honey is an acceptable substitute, though you won’t get the exact flavor. Also, consider using pecans instead of walnuts. Again, not exactly the same, but delicious nonetheless. 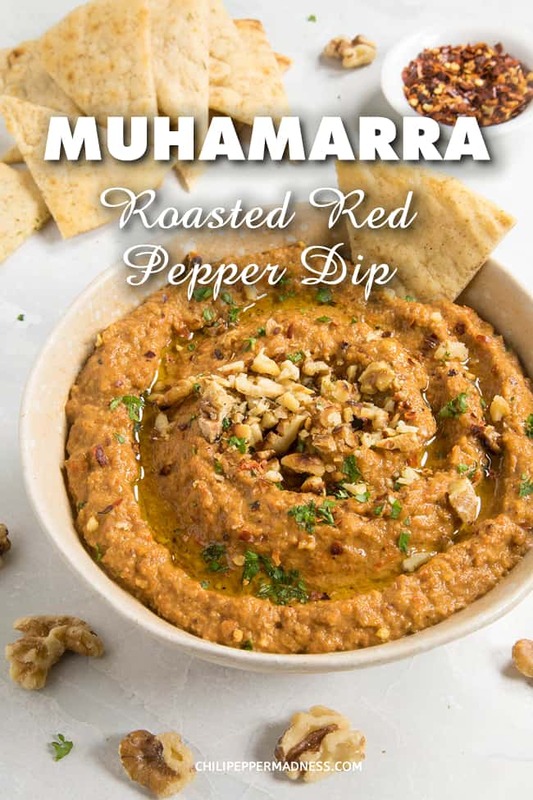 Most people serve their Muhammara up as a dip with pita bread. It is great with thick, crusty bread or crackers. Try it with fresh vegetables as well. I’ve served it with pasta as the sauce, with some lightly poached salmon over the top. Delicious. It’s great over grilled meats and used as a condiment as well. Think sandwich spread or a fun topping for your burger or chicken sandwich. You can play with the ingredient ratios here of peppers to walnuts. Feel free to add more in as desirerd. Also, add in more pomegranate molasses for a sweeter version. It really is great with the sweet factor. Slice the red peppers in half lengthwise and core out the insides. Remove the stem. 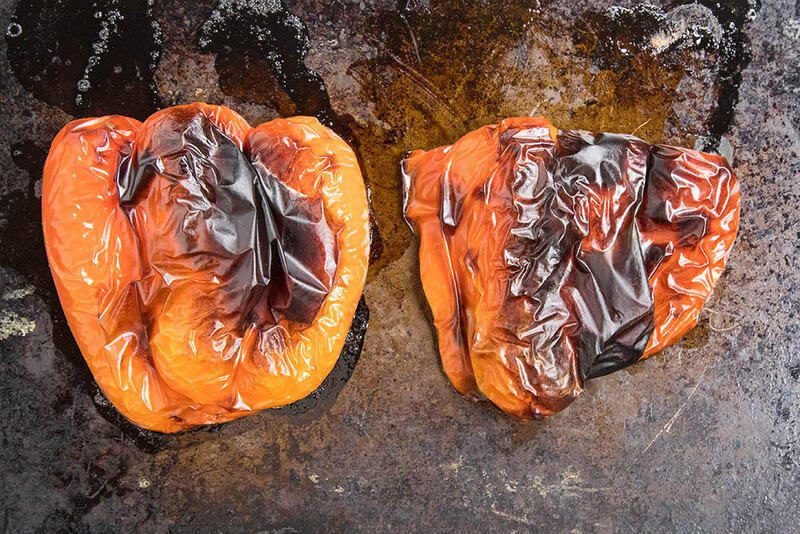 Set the peppers on lightly oiled baking sheets and broil them in the center of the oven for 20 minutes, or until the skins char and bubble up. Remove from heat and cover with paper towels to let the skins steam up. Remove the skins and discard them. Pomegranate Molasses. You can find these in specialty stores, but if you can’t find it, reduce some pomegranate juice until it is thickened. Honey is an acceptable substitute, though you won’t get the exact flavor. Heat Factor: Mild, though you’ll get some spice from the cayenne. Add in more cayenne or spicier chili flakes for a hotter version. Sounds amazing! Love the addition of roasted peppers. 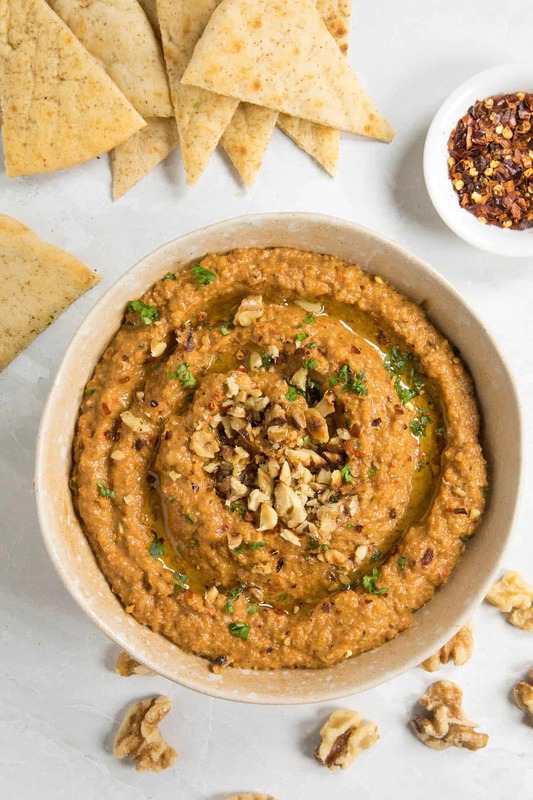 wow and more wow this is my kind of dip love the spiciness and the roasted flavors I need to make this instead of hummus sounds incredibly tasty! A great hummus stand in. In fact, I’ll take this over hummus any day! I love muhammara! It’s one of my favorite things to eat with pita! I know, right? So delicious. This looks so delicious! This is sure to be a party appetizer hit! I’ve got some homemade pomegranate molasse (made for an awesome persian dish)… so I think I’ll try this one very soooon! Wow, Jeremie. You make your own homemade pomegranate molasses? Impressive! I’ve never had this before, and I am missing out! I love everything in this – can’t wait to try it! You’re gonna love it for sure! Oh my goodness this sounds delicious! I bought some pomegranate molasses for a different recipe and I’m so glad to find another recipe to use it!